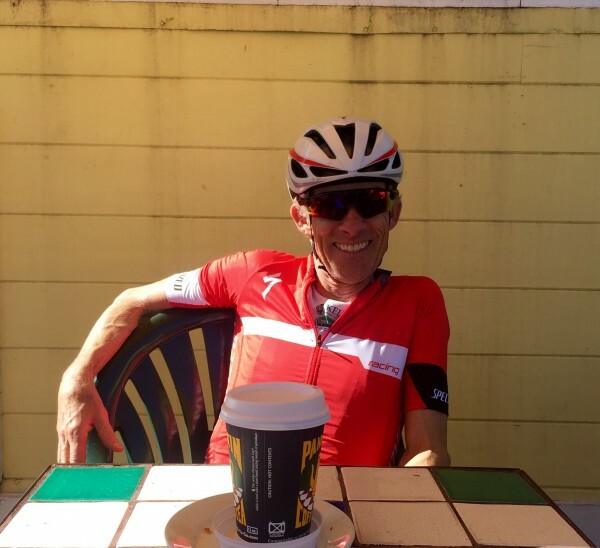 This entry was posted in Comments about Cycling on February 7, 2016 by Steve Tilford. I normally try to hook up and do local rides whenever I am travelling. I think it is a great way to see old friends and feel the “cycling vibe” of the area. It is kind of strange, but each and every group ride has a personality of its own. 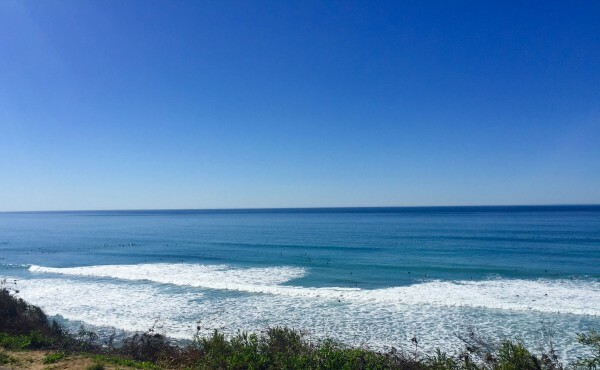 The Swamis ride ,which meets up in Encinitas California, North County, is one of those rides that has been going on forever. Like nearly as long as I’ve been racing I think. For a long time, at least. 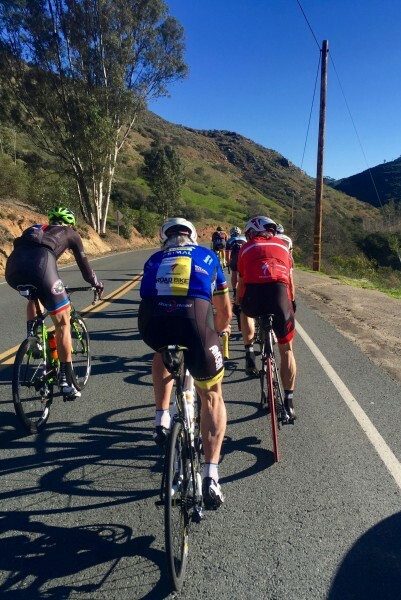 I think about any professional cyclist that has trained near San Diego has ridden this group ride. Yesterday I went to the ride to meet up with my old team mate Ned Overend. I thought we could get in some easy miles and then catch up afterwards. I wasn’t expecting nearly a full on race. I’m not sure if it was because of the weather being unseasonably nice or what, but there was a ton of horsepower out there. It seemed like every pro in the area, plus every ex-pro showed up. So many guys had either stars and stripes or World stripes on their sleeves it was ridiculous. I didn’t see Ned at the start, but we met up soon after we started. Pretty soon we were cruising up the PCH at 30 + mph. And it didn’t really slow down for a long time. Not until after the church sprint in Escondido. I really wasn’t expecting that intensity. I had done nearly 500 miles in the previous week and was a little pooped. About 1/2 way through, the group splits into a long ride or short ride. Ned had some time constraints, plus he just doesn’t ride that far, so we went back to the coast and up to Encinitas. The majority of guys went for the long route around Lake Wolford. Ned and I were only in a small group of 6-8, but we were still going super fast back to Solana Beach. This ride isn’t as hard as the Rocket Ride in Seattle, but it was pretty hard. At least it was for me being tired and not have done any intensity in over a month. 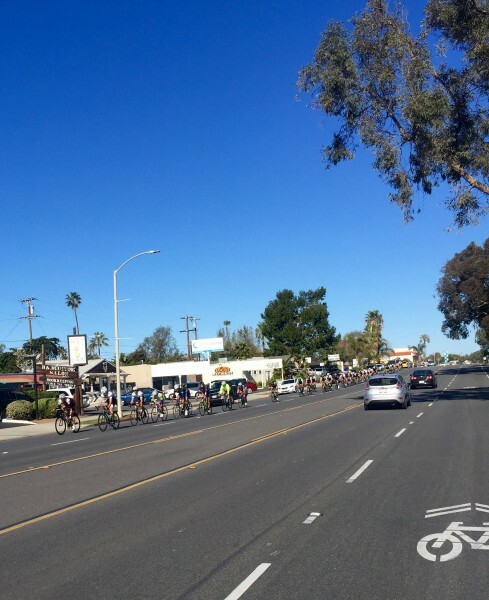 It was truly amazing how many huge groups of riders I saw riding around North County yesterday. At least 10 with over 50 riders, a couple of more than 100 I’d guess. Man, there are a lot of people that ride bikes here. I’m flying back to the cold Midwest today. Missing the whole Superbowl, I guess. Trudi has been dog sitting her sister’s lab in Chicago, plus the new puppy Tucker, so she has been pretty busy. 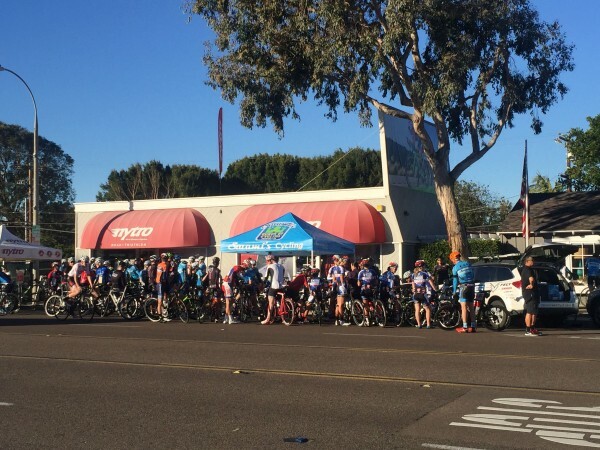 The Swamis Ride mets at Nytro Bike Shop in Encinitas at 8:10 on Saturday mornings. This is Thurlow Rogers, in the blue and Ned, red, riding up the climb in Elfin Forest. Just one of the huge groups heading down the coast. A really nice day, tons of surfers. Ned at the Panikin after the ride. That’s the Super bowl of group rides. I tried to do that ride a couple times. For me it’s an undoable ride. The first time I tried to do the ride I made it just long enough for everyone to pass me, so, what, like 30 seconds? John Howard, dangling off the front, helpfully yelled out “the group is right behind!” as he blew by me. Then the group blew by me just about as quickly. Other times were about as unsuccessful. I could only hang with them after they rolled away from that church rest/regroup simply because they were getting their legs back under them. They’d shell me shortly after that, on the climb after the descent (I could descend fine at least). I can’t imagine actually “doing” the ride. Old joke: What do you call a ride with two or more guys? A race. Grew up in San Diego and you can’t beat it for road rides. I’ll take the mountain biking in AZ over San Diego/Southern Cal though. Steve, curious if you have even done the Shootout in Tucson during the winter and what you thought about it. Not Steve (duh) but I did the Tucson Shootout quite a few times in ’90 something (3 or 4?) when the old Sunflower team did a training camp there. At that point there was plenty of Cat 1’ish horsepower at the front but so many people (maybe 200?) that shelled riders had lots to ride with as the group splintered and ended up with 20 or 30 alone at the front. Thanks Roger. Now days there’s and “old man’s” Shootout that goes off just a bit before the actual “Shootout”. I’ve heard the non “old man’s” can be pretty brutal for even Cat 1 types in Dec-Feb.
Thurlow Rogers is an animal. Look at those legs !